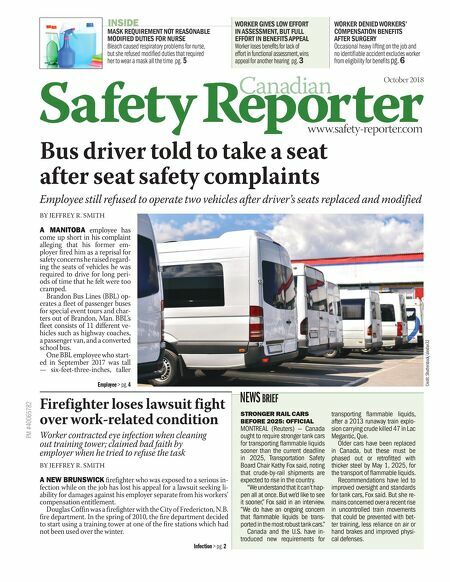 Safety Reporter Canadian www.safety-reporter.com October 2018 Bus driver told to take a seat after seat safety complaints Employee still refused to operate two vehicles after driver's seats replaced and modified BY JEFFREY R. SMITH A MANITOBA employee has come up short in his complaint alleging that his former em- ployer fired him as a reprisal for safety concerns he raised regard- ing the seats of vehicles he was required to drive for long peri- ods of time that he felt were too cramped. Brandon Bus Lines (BBL) op- erates a fleet of passenger buses for special event tours and char- ters out of Brandon, Man. BBL's fleet consists of 11 different ve- hicles such as highway coaches, a passenger van, and a converted school bus. One BBL employee who start- ed in September 2017 was tall — six-feet-three-inches, taller Firefighter loses lawsuit fight over work-related condition Worker contracted eye infection when cleaning out training tower; claimed bad faith by employer when he tried to refuse the task BY JEFFREY R. SMITH A NEW BRUNSWICK firefighter who was exposed to a serious in- fection while on the job has lost his appeal for a lawsuit seeking li- ability for damages against his employer separate from his workers' compensation entitlement. Douglas Coffin was a firefighter with the City of Fredericton, N.B. fire department. In the spring of 2010, the fire department decided to start using a training tower at one of the fire stations which had not been used over the winter. MASK REQUIREMENT NOT REASONABLE MODIFIED DUTIES FOR NURSE Bleach caused respiratory problems for nurse, but she refused modified duties that required her to wear a mask all the time pg. 5 WORKER GIVES LOW EFFORT IN ASSESSMENT, BUT FULL EFFORT IN BENEFITS APPEAL Worker loses benefits for lack of effort in functional assessment, wins appeal for another hearing pg. 3 WORKER DENIED WORKERS' COMPENSATION BENEFITS AFTER SURGERY Occasional heavy lifting on the job and no identifiable accident excludes worker from eligibility for benefits pg. 6 INSIDE NEWS BRIEF Employee > pg. 4 Credit: Shutterstock/alexfan32 Infection > pg. 2 PM #40065782 STRONGER RAIL CARS BEFORE 2025: OFFICIAL MONTREAL (Reuters) — Canada ought to require stronger tank cars for transporting flammable liquids sooner than the current deadline in 2025, Transportation Safety Board Chair Kathy Fox said, noting that crude-by-rail shipments are expected to rise in the country. "We understand that it can't hap- pen all at once. But we'd like to see it sooner," Fox said in an interview. "We do have an ongoing concern that flammable liquids be trans- ported in the most robust tank cars." Canada and the U.S. have in- troduced new requirements for transporting flammable liquids, after a 2013 runaway train explo- sion carrying crude killed 47 in Lac Megantic, Que. Older cars have been replaced in Canada, but these must be phased out or retrofitted with thicker steel by May 1, 2025, for the transport of flammable liquids. Recommendations have led to improved oversight and standards for tank cars, Fox said. But she re- mains concerned over a recent rise in uncontrolled train movements that could be prevented with bet- ter training, less reliance on air or hand brakes and improved physi- cal defenses.